In an isosceles right triangle, two sides equal . Find the length of side . This problem represents the definition of the side lengths of an isosceles right triangle. By definition the sides equal , , and . However, if you did not remember this definition one can also find the length of the side using the Pythagorean theorem . ABCD is a square whose side is units. Find the length of diagonal AC. To find the length of the diagonal, given two sides of the square, we can create two equal triangles from the square. The diagonal line splits the right angles of the square in half, creating two triangles with the angles of , , and degrees. This type of triangle is a special right triangle, with the relationship between the side opposite the degree angles serving as x, and the side opposite the degree angle serving as . The area of a square is . Find the length of the diagonal of the square. If the area of the square is , we know that each side of the square is , because the area of a square is . An isosceles right triangle has a hypotenuse of . Find its area. In order to calculate the triangle's area, we need to find the lengths of its legs. An isosceles triangle is a special triangle due to the values of its angles. These triangles are referred to as triangles and their side lengths follow a specific pattern that states that one can calculate the length of the legs of an isoceles triangle by dividing the length of the hypotenuse by the square root of 2. The base of a right isosceles triangle is 8 inches. The hypotenuse is not the base. What is the area of the triangle in inches? To find the area of a triangle, multiply the base by the height, then divide by 2. Since the short legs of an isosceles triangle are the same length, we need to know only one to know the other. Since, a short side serves as the base of the triangle, the other short side tells us the height. The hypotenuse of an isosceles right triangle has a measure of . Find its perimeter. In order to calculate the triangle's perimeter, we need to find the lengths of its legs. An isosceles triangle is a special triangle due to the values of its angles. These triangles are referred to as triangles and their side lengths follow a specific pattern that states that one can calculate the length of the legs of an isoceles triangle by dividing the length of the hypotenuse by the square root of 2. Now we can calculate the perimeter by doubling and adding . The side lengths of an isoceles right triangle measure . Find its perimeter. An isosceles triangle is a special triangle due to the values of its angles. These triangles are referred to as triangles and their side lenghts follow a specific pattern that states you can calculate the length of the hypotenuse of an isoceles triangle by multiplying the length of one of the legs by the square root of 2. A triangle has two angles equal to and two sides equal to . 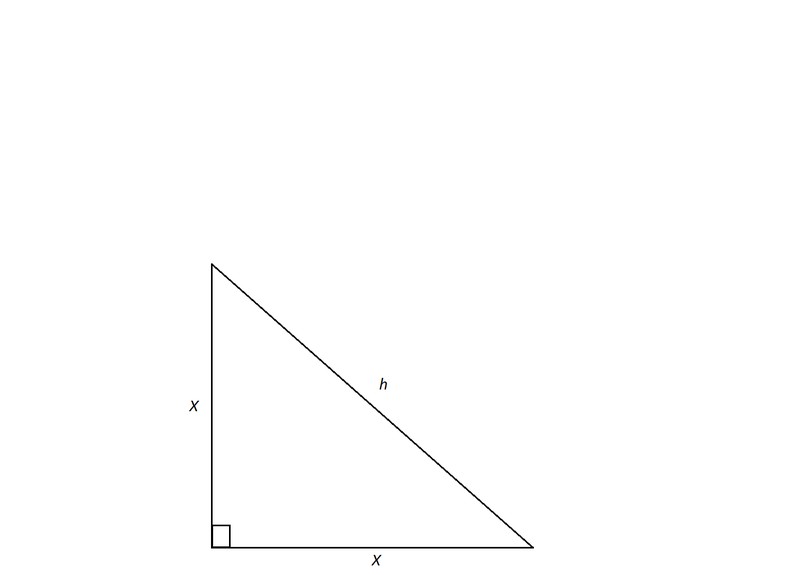 What is the perimeter of this triangle? When a triangle has two angles equal to , it must be a isosceles right triangle. The pattern for the sides of a is . Since two sides are equal to , this triangle will have sides of . Add them all together to get . An isosceles triangle has a base of 6 and a height of 4. What is the perimeter of the triangle? An isosceles triangle is basically two right triangles stuck together. The isosceles triangle has a base of 6, which means that from the midpoint of the base to one of the angles, the length is 3. Now, you have a right triangle with a base of 3 and a height of 4. The hypotenuse of this right triangle, which is one of the two congruent sides of the isosceles triangle, is 5 units long (according to the Pythagorean Theorem). The total perimeter will be the length of the base (6) plus the length of the hypotenuse of each right triangle (5). What is the area of a square that has a diagonal whose endpoints in the coordinate plane are located at (-8, 6) and (2, -4)?